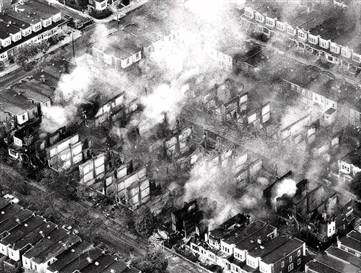 On 11 May 2005, Martha T. Moore reported in USA TODAY, "1985 bombing in Philadelphia still unsettled" -- PHILADELPHIA — The last block of Osage Avenue is a half-abandoned and lonely place. Most of the houses on the narrow street are boarded up. A generation later, MOVE is still around, its members still agitating for the release of eight who have been in prison since a 1978 cop-killing. Most of the other two dozen or so members, all of whom take the surname Africa, live in a house 3 miles from Osage. The mayor who approved the bombing, Wilson Goode, 66, is a pastor who runs a youth-mentoring program. And the residents of Osage Avenue are still trying to get their homes back. Philadelphia has spent $42 million in financial settlements, investigation and rebuilding to try to fix what happened that day. It was a law enforcement failure so spectacular that it would not be equaled until the siege near Waco eight years later. A month ago, 24 homeowners won a $12 million suit against the city for the botched rebuilding and repairs of their homes. "We're still in it," says Mayor John Street, who was a city councilman in 1985. "It's the never-ending story." The memory of the bungled decisions and bad judgment that led police to drop a satchel of explosives from a helicopter onto a residential neighborhood — and the horror that resulted — still stings. "Every year when May comes around, I think of it, of course, because I'll never forget that it's May 13, 1985," says Mary Ellen Krober, a lawyer for the city who negotiated settlements with 11 MOVE families. When the Rev. Isaac Miller arrived in Philadelphia shortly after the bombing, there was little discussion of it, he says. It was too disturbing: The city's first black mayor had dropped a bomb on a black neighborhood. "In many ways, for African-Americans, it's painful to remember," says Miller, an Episcopal priest who will speak Friday at a commemoration. "But ... it has to be" remembered. A commission that investigated found that Goode and two other officials, police commissioner Gregore Sambor and fire commissioner William Richmond, had been "grossly negligent." The deaths of the MOVE children "appeared to be unjustified homicide," it said. Police had not taken them out of the house when they had the chance. They had used excessive force in firing 10,000 rounds of ammunition into the house. The plan to drop explosives was "reckless" and "unconscionable." And they let the fire burn until it was too late to control. Sambor resigned six months later. Richmond retired in 1988. Goode apologized tearfully on TV and was re-elected in 1988. "Everybody was shouting at the television set, 'Put out the fire!' " says Carl Singley, a lawyer who was counsel to the MOVE commission. That five children died, huddled in the basement of the MOVE house, brings tears to his eyes. "I imagine those last hours down in the basement," he says. The confrontation came after months of complaints from neighbors about MOVE, which is not an abbreviation for anything. 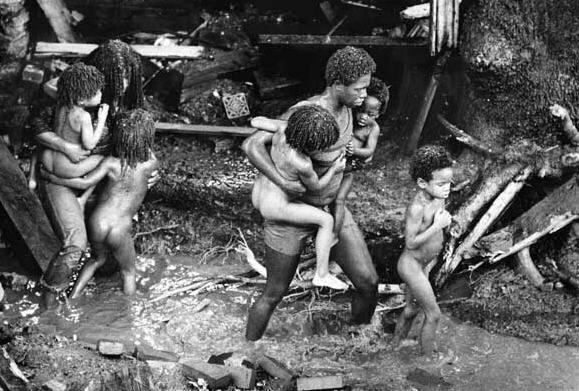 Members broadcast political harangues on bullhorns day and night, threw garbage and filth into their yard and kept their children naked as part of a dedication to "Mom Nature." The violence was touched off when police tried to evict members and arrest some of them. "You can say whatever you want about the adult MOVE people in the house and whether they got what they deserved," says John Anderson, co-author of Burning Down the House, a book about MOVE. "But there were kids in the house." Eight years later, the standoff between federal agents and the Branch Davidians near Waco, Texas, echoed the MOVE scenario. Since then, says Henry Ruth, who served on commissions investigating MOVE and Waco, police have changed their tactics. In 1996, the Montana Freemen standoff ended peacefully when federal agents simply waited out the Freemen. "They learned a lot from Waco, and I think they learned from MOVE about the inevitability of tragedy when you start raiding a cult where you have no contingency plan," Ruth says. "Law enforcement has seen the need to wait and wait and wait. I think we've learned a lot of lessons. But it took MOVE and it took Ruby Ridge and it took Waco to learn that, and that was over 100 lives." One of the two who escaped the fire, Ramona Africa, 49, spent seven years in prison for riot and conspiracy. Today, she earns her living speaking about MOVE and Mumia Abu-Jamal, a death-row inmate convicted in an unrelated 1981 killing of a police officer. "I am angry, and bitter, and justifiably so," she says. "Not a single official went to prison for murdering my family," referring to the whole Africa clan. The bombing, she says, was "not bad judgment. That is murder." Members now live in a big house in West Philadelphia, eat "a lot" of raw food, Africa says, and home-school their children. But the tactics have changed, she says, since the bombing drew the world's attention. "It's not necessary for us to be on the bullhorn now. People are calling us for information." Today, the site of the bombed house, 6221 Osage, is occupied by the police Civil Affairs Unit. The city rebuilt Osage Avenue, but the construction was so shoddy that years of repairs failed to fix the homes. Finally, the city condemned them and offered owners $150,000. Many took the buyout, but 24 families went to federal court. The city is appealing the judgment. "I'm really disgusted," says resident Nan Chainey. I'm tired, and I want to end this thing." Twenty years of struggle left the residents of Osage Avenue distrustful of the government they asked in 1985 to help them with their neighbors. Philadelphia did not bomb their own. They bombed a group of left wing terrorists who had an arsenal and would not leave when evicted. They hid behind children as sheilds, just like left wing liberal scum always do. Oh and one more thing, all of them look like obamas offspring . GOD BLESS THE SPIRIT OF THE INNOCENT AFRICA BABIES MURDERED BY THE PHILA POLICE STATE,thank you for your website and writeup ,I am writing this response as I am watching 'let the FIRE BURN ' on pbs, the memories are deep and painful for me and likewise to other conscious people,and to the Black community at large no mater their opinion,becuase the murder/legal lynching of a family, I had seen the family many times during their trips to 69th st food shoping etc, it was/it is a scar philly will carry forever, the children were murdered! , none there deserve to die that day! BLACK LIVES MATTER! 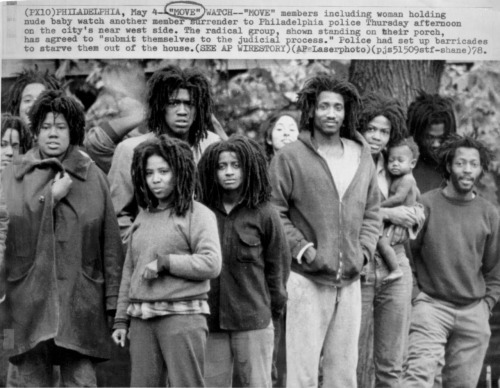 ironically right after this holocaust ,phily black community was flooded with crack! But thank god and our ancestors,The African centered movement began to re- establish it self, although the Black community was numb for a while, but the african giant has awaken because the spirit of resistance to white supremacy and oppression will never die UNTIL JUSTICE IS DONE! LA LUTA CONTINUA,BLACK PEOPLE YOU ARE THE ICON OF HUMANITY AND YOUR STRENGTH IS GOD SOURCE OF LIGHT !